The Catholic Diocese of Westminster is home to the Archbishop of Westminster, Westminster Cathedral, over 200 parishes and over 200 schools in London and Hertfordshire and is a registered charity of significant proportions. Based in our central service offices at Archbishop’s House, SW1 the post-holder will help deliver a positive media profile for the Diocese and provide comprehensive support to the Director of Communications in promoting our work through a variety of channels including print, the web and social media. This one goes out to Caroline Farrow and John Smeaton. This next one goes out to the Bishops of England and Wales. I have one day to save my van. I can't afford the MOT repairs. It will cost £800 minimum to get the brakes sorted. I can't get a new tax disc without an MOT. The tax disc runs out on 31st December. I can't declare it SORN (off-road) because it is parked on a public highway and I have nowhere to park it. George has said he might take it off my hands but he is currently unsure about taking it on. The organisations I have written to asking if they would like it have not replied, I guess due to the Christmas break. If George doesn't take it, and I don't have the money, then this beautiful van will die and be taken to a scrap heap. Sad, but true. I did receive one donation via paypal though I don't know how they found my account on paypal. If the kind person would like to come forward I will refund them by cheque for their kind donation of £50. It looks like this van is going to the local Poor House, Emmausin Portslade. The life of St Thomas Becket is to be remade to reflect a more modern and nuanced age. In the new version of the tale of the martyrdom of the Archbishop of Canterbury, Becket says of the King's plans that threaten the Church, "Who knows what's down the road?" 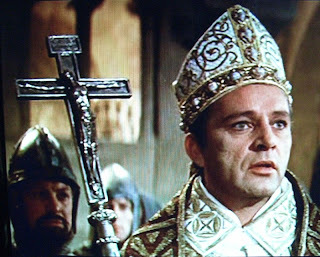 The famous excommunication scene of the 1964 classic has been dropped by the makers of the new version because of the lack of nuance involved in excommunication. I was telling a friend of mine about the legend of the Robin's red breast. He loved it. I didn't know there was a song about it. How sweet! Let's hear it for the Robin, people! Give it up for the Robin! Legend has it that when Our Lord was dying on the cross, the Robin, then simply brown in colour, flew to his side and sang into his ear in order to comfort Him in His pain. An echo thru the ages, from distant Calvary I'll tell it to you simply, as it was told to me. It breathes the blessed teaching, of God's own holy word A lesson taught in meekness, by a lowly little bird. When Jesus hung in sorrow, our debt of shame to pay No one was there to comfort, or wipe His tears away. A little bird flew near Him, in sober coat of brown And gazed in tender pity, then slowly fluttered down. The Telegraph today reports on the rise in abortions to reduce multiple pregnancies as a result of IVF treatment. 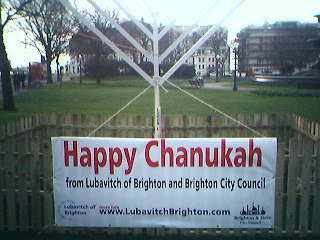 ... but there is a Happy Chanukah scene in the gardens on the Old Steine, sponsored by Brighton and Hove City Council. Quite sizable it is too. May I take this opportunity to wish all my Jewish readers a very happy Chanukah and Merry Christmas to Jews and Gentiles alike. Fr Ray Blake has posted on what he sees as a division within Holy Church between a liberal wing which emphasises Catholic social teaching at the expense of the fullness of the Catholic Faith and an orthodox wing of the Church which emphasises the importance of good liturgy, worship and the defense of the unborn but, by implication of his reasoning, is a little indifferent to social justice. I suppose the inference of his post is that the post-Vatican II Church is confused about where Her priorities should be. The answer is. They must all be in Churches. Merry Christmas, by the way. I can say that to you because I'm not in the US House of Representatives and you are not my constituents. Fr Z today posts on The Catholic League's Nativity scene in New York City. It is sad that we are at a stage in history in which, here in the West, Catholic organisations have to fight tooth and nail to remind New Yorkers of the 'reason for the season'. A few years ago, I managed to obtain a Nativity scene in Brighton from a Wesley Owen Bookshop which has since closed down. It was £35 and I no longer have it. This year, it hasn't happened. As far as I know, nowhere in Brighton sold them over the Christmas period. I think I saw a really small shoddy one made of wool in a charity shop window, but I'm not sure that was even for sale. I totally missed this movie when it was released, but I really recommend Ratatouille. Pure comedy genius. You can watch it on BBC IPlayer here. "Anyway, so I was just fiddling about with my guitar and came up with a few chords. I was going for a kind of 'medieval' folk Christmas song and then the lyrics came to me. Not bad, eh?" 'Dear Brothers and Sisters in Rome and throughout the world! 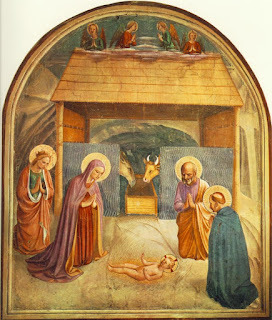 Christ is born for us! Glory to God in the highest and peace on earth to the men and women whom he loves. May all people hear an echo of the message of Bethlehem which the Catholic Church repeats in every continent, beyond the confines of every nation, language and culture. Radical Islam is dangerous to the World in as much as it destroys bodies. Radical Catholicism is dangerous to the World in as much as it changes lives and saves Souls. Today, in Nigeria, the Catholic Church received a bloody Christmas present from radical Islamists: Martyrs. If Ron Paul win's Iowa the media will ignore the result and play down the importance of Iowa in the Republican race. If Ron Paul wins the US Presidential election he'll be dead the following week. It is not often that I ask you to pray for me, but I feel that I am coming to a 'crossroads' in life (whether I am in the van or not). I would appreciate your prayers very much. I feel like I am in something of a hole and that my current state in life, where I am living, my chaotic lifestyle, my lack of proper employment, my lack of a vocation and my really now being something of a perennial tick on the behinds of my parents, friends and now on the entire global Catholic online community, is becoming terribly tiresome. I'm 34 for Heaven's sake. It is kind of forcing me to look at how things are and where things are headed, or indeed, not headed, because things are headed nowhere. For a start, my front headlamps don't work properly. The simple truth is that God's response to man's search for Truth is so simple and so true that it can be overlooked entirely. This is because of God's Absolute Humility. His Absolute Humility will confound our expectations always and everywhere. We always expect God to be like us, not like Himself. When He comes into the World as 'one like us', we still expect Him to be like us and not like Himself. Now that He has ascended we still imagine He will be like us, but He is not because His 'ways are not our ways' and His 'thoughts not our thoughts'. We worship Him as the Almighty God and so He is and, yet, He is the Humble One, not us. Is it not the case that those who seek 'evidence' and 'scientific proof' for God's existence demand to 'see the evidence' because if we were God, that is how we would choose to reveal ourselves? Our beloved Pontiff has visited inmates at a Roman prison. CNS carries a good report of His Holiness's time with prisoners which I have posted below. Pope Benedict XVI told inmates at a Rome prison that people say nasty things about him, too, but it's important to remember that there are other people ready to offer their love and support. During a visit Dec. 18 to Rome's Rebibbia prison, the pope gave a short speech and then responded to questions from six of the inmates gathered in the prison's Church of Our Father. Federico, an inmate from the prison infirmary, which includes men who are HIV positive, told the pope that people say "ferocious things" about the inmates. "We have fallen and hurt people," he told the pope. "We have lost our freedom, but we ask you to help ensure we don't lose our dignity." The Telegraph has today reported on the story of Hollywood star, Christian Bale, who has received some condemnation from Chinese authorities for attempting to visit a human rights activist in eastern China. Video above shows the incident in which Chinese forces stop Bale from visiting an activist. The Telegraph omitted to mention that while it may not have been the primary reason for Bale's attempted visit to the blind activist, the man he wanted to see Chen Guangcheng, who is actually a pro-life activist. The Telegraph article doesn't mention this, but Life Site News, of course, does. Well, I am quite sure that there are numerous, a veritable truckload of more worthy causes to which you can donate this year, but my van has failed its MOT and I cannot realistically afford to pay for the dramatic failure of its MOT on my wages. I've been quoted that the repairs needed for the van to be fixed will be £1000. 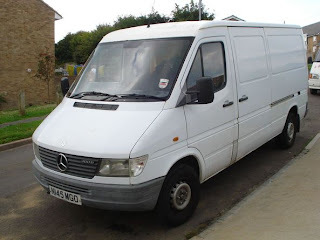 Obviously, I would consider selling the vehicle, and I certainly could do so, if there were someone who wanted to buy a very nice van which has failed its MOT then I'm certainly open to negotiation. Looking back, I'm not sure this purchase was a wise one. I'd consider donating it to some monastery or friary or something like that who had a mechanic in their orders who could make it roadworthy. I don't know whether readers have been to Turin to make pilgrimage to the Holy Shroud. The subject of the Shroud is again in the headlines this week, following an announcement from Italian scientists that there is little chance that the Shroud is a medieval forgery and highly likely that it is the authentic burial cloth of Christ. 'The scientists set out to "identify the physical and chemical processes capable of generating a colour similar to that of the image on the Shroud." They concluded that the exact shade, texture and depth of the imprints on the cloth could only be produced with the aid of ultraviolet lasers – technology that was clearly not available in medieval times. I've been struck by the outpourings of grief in North Korea, where the People's Republic's beloved leader, Kim Jong-Il (God rest him) has died, apparently, of a heart attack. I'm assuming that there is no Christianity in North Korea. I'm assuming that if there ever was Christianity in North Korea, that it has been 'destroyed'. Perhaps Dawkins looks to North Korea as something of a model, in terms of religious expression. The year is 2025 and Richard Dawkins has achieved his goal of destroying Christiantiy. What does the new Atheist Republic of Great Britain do at Christmas? Well, I guess you'd have to somehow replace Christmas Day with something. You could call it 'Atheism Day', celebrating the height of the atheistic winter season. You may as well keep the Christmas Tree, because, anyway, those Christians nicked that idea from the pagans, right? Atheism Day decorations could be as pictured left to remind the citizens of the glories of atheistic regimes of the 20th century, such as mass murder on a hitherto unprecedented scale. 'That the most partially formed human embryo is both human and alive has now been confirmed, in an especially vivid sense, by the new debate over stem-cell research and the bioethics of cloning. If an ailing or elderly person can be granted a new lease on life by a transfusion of this cellular material, then it is obviously not random organic matter. In the scientific community, is there any consensus as to what stage of development of the vegetable, it acquires 'onion status'? Also, any gardeners out there who go ripping their embryonic onions out of the soil before they are edible? Isn't it the case that onions are left to develop because onions are wanted, whereas babies are not? Surely to do such a thing would be to act against nature and ecology. To do such a thing is senseless, but abortion is more senseless, naturally. I was starting to wonder whether it is only the retail world that keeps Christmas going in this country. I don't think the world of retail, somehow, is going to let Dawkins get his way in 'destroying Christianity'. Sorry, Richard, but I think there's too much money at stake. I wonder whether soon, even atheists are going to suspect Dawkins of some state of perfect demonic possession. You go through your whole life being told by the Government to eat five portions of fruit and vegetables a day. They also encourage you to drink lots of water because that's healthy. They need to be more consistent. Why do they bother telling us in the first place? Is it just so that we'll be economically viable during our work years or something? Hi, my name is Laurence and I'm a clump of cells. The only difference between me and a week old fetus is that this clump of cells, me, is more developed than a clump of cells in the womb. But I'm still just a clump of cells. So when do we decide that a clump of cells becomes human or worthy of protection under law? I expect Dawkins probably has the answer. He's a biologist, you know. I am certain Hitchens has the answer because he has now met God. May the Lord grant him a merciful judgment and may his soul rest in peace. That's all I can put it down to. So far I've written about 7 or 8 songs and put them on my blog but as yet, none of the national music press has picked up on my music. Oh, how convenient! It begs the question: Why? Why am I not on the front cover of the NME? Why? Because of anti-Catholicism, that's why. Why have not calendars been produced with me posing in different costumes in different settings, like on a motorcycle dressed in black leather in March, for each calendar month, or in an Alpine resort in December? Why? Because of anti-Catholicism, that's why. It's the only possible explanation. Why haven't I been signed to a major record label? Why? Because in the wake of the Second Vatican Council and the 'spirit of Vatican II', the Catholic Faith was so decimated that all the Catholic record labels were closed down. The blame for this should be laid squarely at the feet of the Bishops Conference of England and Wales. It may be that you will never change a poor man's life. Don't worry, he will change yours. The power to change lives belongs to God alone. It may be that you will never help a poor man to stop drinking so much. Don't worry, he will help you to stop drinking so much. The power to help people to stop drinking so much belongs to God alone. It may be that you will never help a poor man to live less selfishly. Don't worry, he will help you to live selflessly. The power to help people to live selflessly belongs to God alone. It may be that you will never convert a poor man. Don't worry, he will convert you. The power to convert people belongs to God alone. It may be that you will never save a poor man's soul. Don't worry, he will save yours. The power to save souls belongs to God alone. I noticed while driving in Brighton the other day that Brighton's Occupy movement has disappeared, so hold that delivery of a nativity scene for them for Christmas. The BBC report, with attending picture (left) is a little confusing as to why the 'occupation' of Victoria Gardens suddenly ended. 'Firstly we would like to say a huge thank you to everyone that has supported the Occupation in Victoria Gardens. The camp has been destroyed by a combination of terrible storms and a fire at the camp which damaged tents and equipment beyond repair. The site has now been removed. We have done our best to re-seed the garden, even though it is really the wrong time of year. The park and the local people that visited us have a special place in all our hearts now. We will continue to repair the park until it is as good, or probably better than when we found it.